I LOVE glitter. Some would call me a magpie. I also LOVE fall colors, and am enjoying the trees that are turning in my neighborhood. 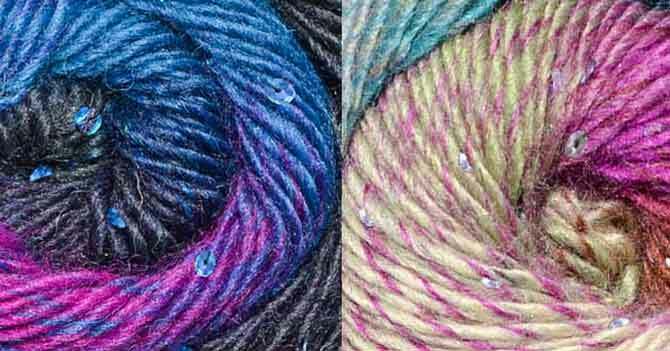 As luck would have it, I get the chance to review today’s yarn, Classic Shades Sequins Lite by Universal Yarn, and my skein of the Volcano colorway has both! 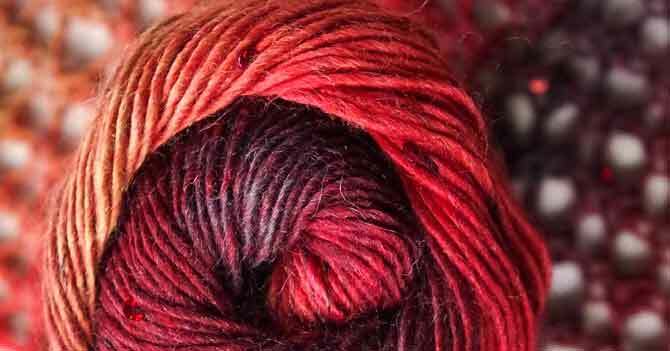 This warm and glittery yarn is perfect for those who love autumn colors like plum and merlot and coral. Classic Shades Sequins Lite is a DK weight yarn that’s very versatile because it comes in a variety of gradient colorways. Each colorway has sequins that coordinate well with each color in the gradient (I love the red sequins in this Volcano colorway), and even though it’s single ply, it has enough twist that’s well set, so it can be worked with larger needles and still keeps its integrity. Sequins Lite is 22% wool, and 74% acrylic. Like the other yarns in the Classic Shades family, the acrylic fibers are long enough that pilling doesn’t happen without an extreme amount of friction in one place, and the yarn is lofty and soft. There’s no scratch to the wool content either. But if you’re good at mental math, you’ll note that these numbers only add up to 96%. The last 4% is the payette material, aka “the sequins!” Part of the acrylic fibers are spun in a separate, tight thread which traps the sequins and spaces them randomly throughout the skein. There are plenty of sequins with 7 or 8 appearing in each yard of yarn. I worked up this little slipper sock on size 5 US [3.75mm] needles to see what the yarn looked like at a firm DK-weight gauge and I really like the results. When I showed these slippers to someone they asked about whether the sequins would irritate the skin or catch and rip off. You cannot feel the sequins at all, and I made these kid size so they would only be worn for a season at most. While I haven’t yet been able to put it to the test, I don’t really find that these “catch” on anything as the knit fabric grazes across tile or hardwood floors. There are 264yds [240m] on each skein, so I would be able to make about 3 or 4 pairs of kids slipper-socks with one skein. Some lucky child could have the same slippers, just 1 size bigger each year, 3 or 4 years in a row. The ball band recommends size 7 US [4.5mm] needles for a gauge of 20 sts to 4″ [10cm], which is the normal combination for a worsted weight gauge. But I tried it and it works. 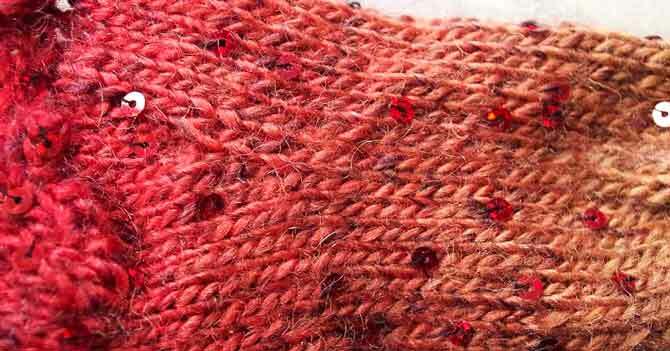 With size 7 needles, the fabric has lovely drape and the stockinette stitches are consistent and even. I would show this, but I forgot to take a picture before I frogged my swatch to make tomorrow’s project. Mustard, pumpkin, coral pink, and merlot transition gently from one to the other in this gradient yarn. 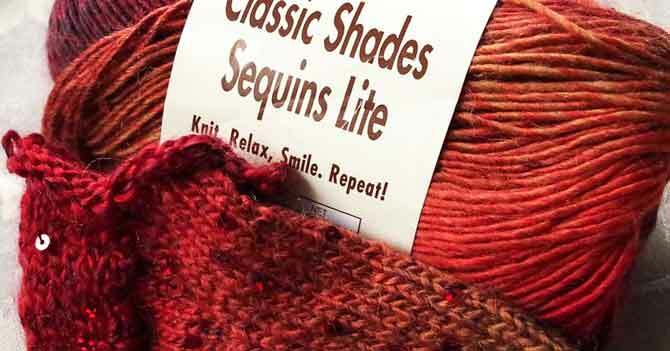 Speaking of frogging, Classic Shades Sequins Lite took the treatment of being knit and frogged once quite well. The tricky part is ripping out the knitting and not catching the sequins. So while it does un-knit quite well, I’d suggest you undo your knitting with care rather than rip out in haste. 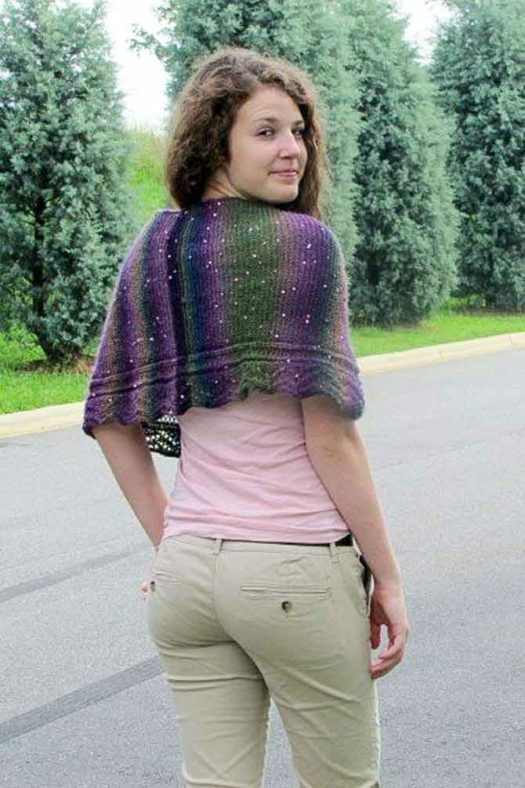 To give you an idea of other colorways, I’m sharing photos of 2 of the 8 other colors, and a free shawlette pattern worked up in a third colorway. The “Rainforest” colorway on the left and the “Lucky Rose” colorway on the right feature royal blue and mother-of-pearl sequins respectively, the perfect complement to the other colors in the yarn. The Zig Zag lace shawlette in the 405 Primrose colorway is a warm, shoulder-hugging capelet style shawl. Zig Zag Lace Shawlette – free pattern courtesy of Universal Yarn. Tomorrow we’ll look at the pattern for a mega-scarf in that lacy stitch pattern you may have noticed in the background of the above photos. Wow – such a beautiful result. I had no idea sequins would be so eye catching (and apparently easy). I know, right? 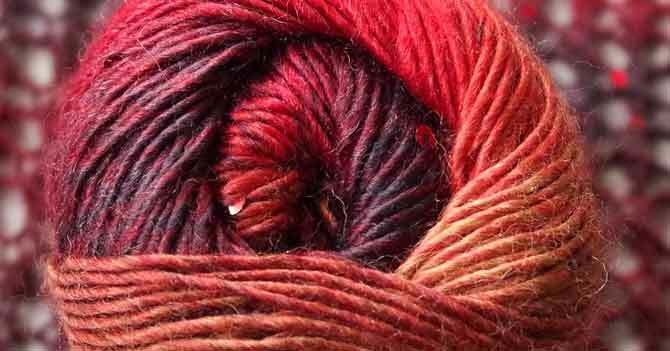 I enjoyed the brilliance of this yarn. I’m drooling over this yarn! Thanks for sharing it with us! You’re welcome. I hope you try to make something with it! 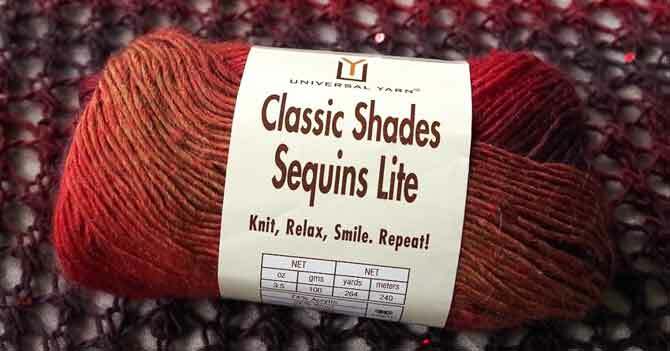 Love the red Classic Shades Sequins Lite yarn! Can’t wait to make a “pretty” using the Fall colors. Please share with us what you knit with it, when you do!